Visit here for full coverage of the Orlando mass shooting. 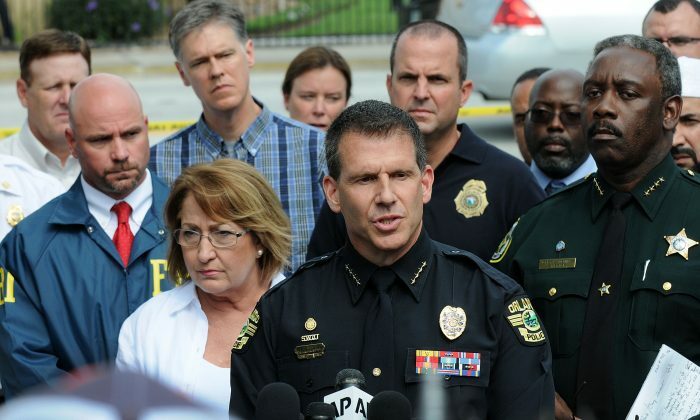 Orlando Police Chief John Mina sent an email to all staff in the department on Sunday evening, about 18 hours after responding to the worst mass shooting in American history. “On the darkest day of my 25 years at the Orlando Police Department, I wanted to take a moment to tell all of you how proud I am of the work you have done today and will do over the next days and weeks,” Mina said. “We have trained again and again for this type of situation. It’s unfortunate that we had to put those skills to use today. But because of that training and your professionalism, we saved dozens of lives this morning. “Even before the first patrol units arrived on the scene, an OPD officer working extra duty at the club engaged the gunman as he opened fire. Our First Responders and SWAT Team faced a hail of gunfire as they rescued the hostages, and we are blessed beyond words that none of them were gravely injured or killed. “We’ve received an enormous amount of tactical Law Enforcement support from local, state and Federal agencies. The outpouring we have received from our Central Florida community and Law Enforcement across the nation and the world, has overwhelmed me with gratitude. “I know that you have all been affected today by the tragic actions of a lone terrorist who cut short the lives of so many. Our community, our City, and our Department will be grieving in the days, weeks and months to come. “But on a day like today – and every day – I couldn’t be more proud to be your Chief.